Frode Moen is currently the head manager of the Norwegian Olympic Sports Center in the Mid-Norway region, where he also has a position as a coach / mental trainer for elite athletes and coaches. He also is an associate professor at the Department of Lifelong Learning and Education at the Norwegian University of Science and Technology. He previously has worked as a teacher in high school where sport was his major subject, and he has been a coach for the national team in Nordic combined in Norway for several years. Frode received his Ph. D. in coaching and performance psychology from the Norwegian University of Science and Technology. His research focuses mainly on coaching in business, coaching in sport, communication, performance psychology and relationship issues. This current study examines if a perceptual-cognitive training program, such as the Neurotracker (NT) 3-dimensional (3D) multiple object tracking (MOT) device, has the potential to improve elite athletes’ performances in dynamic sports. Fifty-four elite athletes from boxing, wrestling, women handball, women soccer, orienteering, biathlon, alpine skiing, sled hockey, badminton and table tennis completed a pre-post quasi experiment over a period of 5 weeks (46% males and 54% females). The results show that the NT baseline scores and subjective performance improved significantly during the experiment. However, subjective performance improved only when learning rate and number of targets were controlled for. The results are discussed in regard of applied implications and possible future research. The arena of elite sports is known to constantly search for ways to enhance important capacities relevant for sport performance. Several studies in sport psychology point out the importance of highly developed attentional resources, especially in dynamic sports such as basketball, soccer and ice hockey (2, 16, 17, 22). Dynamic sports are particularly demanding because of the constant, rapid changes in the environment during execution. These include the movement and tracking of teammates and opponents, and/ or a rapidly changing visual field, for example when skiing in an alpine track in high speed (1). In dynamic sports, athletes are confronted with multiple choices and must correctly and efficiently extract the most salient visual information from the environment to respond appropriately to the situation. Making the wrong decision might have costly consequences on performance. Therefore, attention is necessary to put the most important and specific aspects of the sport environment into focus, and for rapidly shifting focus when necessary(such as when there are rapidly changes in the sport specific environment), while ignoring potential distractions (12, 24, 25). Interestingly, several studies show that athletic experts (athletes with high levels of skills) are both faster and more accurate in their decision-making than lesser skilled athletes (20). These studies show that athletes’ ability to quickly perceive and extract the most important information in the environment, interpret that information to decide what action is needed, and then execute those actions to handle the situation optimally, is key to high-level performance (19). Interestingly, improvement of the attentional resources that are so crucial in dynamic sports may be achieved with perceptual-cognitive training (3). Given the importance of perceptual-cognitive skills, it is not surprising that training programs aimed at improving abilities needed for enhanced performance have a relatively long history of use (21, 30, 35, 37), and that such programs continue to be developed today (1). Research shows that practice leads to substantial gains from perceptual learning and that this effect can last for months or years (3). Given the technological development of the last decade, there has been a tremendous growth in new digital technologies that are used in perceptual-cognitive training programs. Indeed, research has documented that elite athletes’ perceptual-cognitive abilities are significantly better compared to less skilled athletes (9, 20), and dramatically better compared to non-athletes (11). Despite elite athletes’ clear superior attentional skills, research shows that even they may gain improvements when using perceptual-cognitive training programs (11, 27, 33, 38). Faubert (11) shows in one study that not only are elite athletes improving, but they also have a faster learning rate. Findings also show that perceptual-cognitive training is correlated with actual game performance in professional basket players (19) and game performance in soccer players (34). Therefore, perceptual-cognitive training seems to achieve the desired outcome: improved performance. However, studies of both Mangine and colleagues (19) and Romeas and colleagues (37) only confirm a transfer effect from perceptual-cognitive training on parts of the athlete performance. The challenge in research assessing the effects of perceptual-cognitive training on athlete performance remains that none of the previous studies measured the impact of training on performance as a whole. Therefore, previous research suggests that there is vast room for improvement of perceptual-cognitive abilities in elite athletes, and that athletes’ ability to learn how to process complex dynamic visual scenes seems to be crucial for performance in dynamic sports. Hypothesis 1: Cognitive-perceptual training will improve the specific training skills used in training. Hypothesis 2: Cognitive-perceptual training will improve subjective sport performance in dynamic sports. Sixty elite athletes practicing a variety of sports were invited by the authors to participate in the investigation. Athletes were randomly chosen from a cohort of athletes who compete in dynamic sports and are involved in projects with the Norwegian Olympic center in mid-Norway. The invited athletes were from martial arts (9.3%, boxing and wrestling), women handball (14.8%), women soccer (14.8%), orienteering (20.4%), biathlon (14.8%), alpine skiing (18.5%) and Paralympic sports (7.4%, sled hockey, badminton and table tennis). From the 60 participants, 54 (46% males and 54% females) completed the study, which gives a response rate of 90%. The sample had a mean age of 22 years (ranging from 17 to 35 years). Data from the current study is a part of a bigger data set that is used in different theoretical approaches. The Norwegian Social Science Data Services (NSD), which is the research ethic board for social sciences in Norway, approved this study. Researchers gave oral information about the study to the athletes’ coaches and coaching staff, and sent information about the study by mail to the athletes. Thereafter, athletes received an invitation to participate in a survey by e-mail, which included questions covering demographics such as age, gender and type of sport. Further, a questionnaire measuring performance satisfaction was included. This measurement was based on a previously developed scale, proven to hold satisfactory validity and reliability. Athletes were given one week to complete the questionnaire. After completing the questionnaire, athletes received a license to use the perceptual-cognitive tool used in the current study. At the beginning of the study, athletes were completely unfamiliar with the tool to avoid possible training effects confounds (11). Instructions were given to perform at least 4 sessions per week for a period over 5 weeks. After completion of the period dedicated to perceptual-cognitive training, a post-test was administered to measure performance satisfaction. Athlete Satisfaction Questionnaire. To measure athletes’ perceived satisfaction with their own performance in their specific sports, the sub-scale “Individual performance” from the Athlete Satisfaction Questionnaire (ASQ; 32) was used. In this scale, athletes are asked to evaluate four items related to their satisfaction with their own sport specific task performance over the last month. Task performance includes absolute performance, improvements in performance, and goal achievement. Athletes gave their answers on a 7-point Likert-scale, which ranged from 1 (not at all satisfied) to 7 (extremely satisfied). An example item from this scale is “I am satisfied with the degree to which I have reached my performance goals during the last month”. Thus, this measurement is a subjective expression of the athletes’ development and overall sport-specific performance. Previous research has supported the criterion validity and the internal consistency of ASQ (31). Cronbach’s alpha for the subscale “Individual performance” of ASQ in the current study was .93. Perceptual-cognitive tool. The perceptual-cognitive tool used in the current study was the Neurotracker (NT) 3-dimensional (3D) multiple object tracking (MOT) device (28). An online version of NT 3D MOT was used, and athletes were instructed to sit upright on a stool in front of their computer with a pair of 3D glasses for each trial. The NT 3D MOT device uses a 3D transparent cube containing eight identical yellow balls that are presented on the screen. In the first stage of each trial, two of these balls were randomly illuminated for 2 seconds while marked with a red color, before returning to the baseline yellow color again. Athletes were instructed to track the two balls while all the eight balls were moving simultaneously and randomly in all areas of the cube for 8 seconds. The movement speed was adjusted according to the current level. After 8 seconds, the balls were frozen in their individual space and assigned a number from 1 to 8 by the computer. Athletes were instructed to identify the two balls they were originally asked to track by clicking on them in the cube with their mouse or keyboard. The movement speed of the balls depended on the score the athletes received on their previous session. If the athletes correctly selected both two balls, the speed was increased, if not, the speed was reduced. All athletes started their sessions with tracking two balls and increased up to maximum tracking of four balls. Relevant variables were detected as baseline scores in the beginning of the training and at the end of the 5th week of training. The 3 first sessions were used to compute the geometric mean defined as the initial baseline and the 3 last sessions they completed in the experiment period were used to compute the geometric mean defined as current baseline. The scores from the last 3 sessions the athletes completed were computed as if the user had been using 2 targets and defined the variable baseline at 2 targets. The number of balls they were tracking was defined as number of targets. The variable improvement rate was calculated to measure if and how much the athletes had improved from when they started using NT 3D MOT. The following formula was used to calculate the improvement rate: (Baseline at 2 Targets – initial baseline) / initial baseline. Learning rate was defined by the athletes’ score had they been tracking at 2 targets. Firstly, data was analyzed by examining the correlations between the variables by using the Pearson correlational coefficient. Then, descriptive statistics such as statistical means, standard deviations, maximum and minimum values and the Cronbach’s alpha were computed. A paired-samples T-test was then conducted to analyze possible differences between pre-test and post-test values in baseline scores and subjective performance. Furthermore, analysis of covariance (ANCOVA) was conducted to control for variables that might explain potential effects on the dependent variable. ANCOVA is an extension of analysis of variance (ANOVA) and allows exploration of differences between the dependent variable at different times, while statistically controlling for an additional continuous variable. In the current study, the covariate is the participants’ learning rate during the study and the number of targets used in training. Thus, ANCOVA increases the likelihood that differences between the pre- and post-test when controlling for potential covariates are detected. Table 1 shows correlations between the study variables as well as the statistical means, standard deviations, minimum and maximum scores from the variables. The correlation analysis shows that there are moderate to strong positive relations between initial baseline and learning rate, and current baseline and learning rate, and that there is a strong negative relation between initial baseline and improvement rate (4). Other variables share zero order correlations. The descriptive statistics also show that there are large variances among the elite athletes regarding the number of completed training sessions. 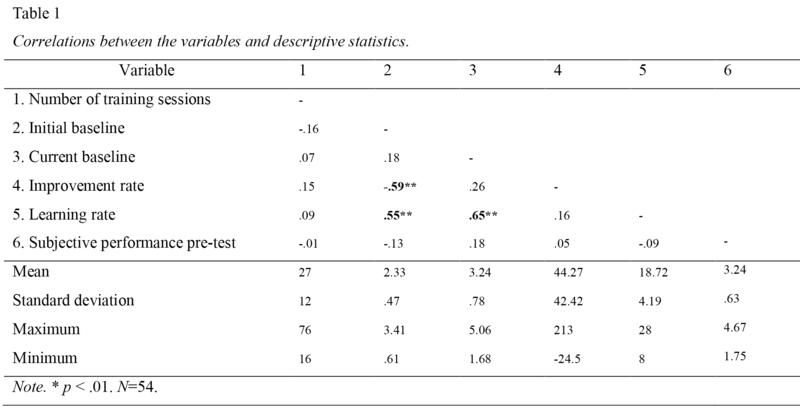 A paired samples T-Test was used to control for possible effects from the NT 3D MOT experiment on NT scores (pre-test/initial baseline vs post-test/current baseline) and subjective performance (Table 2). At the post treatment test there was significant differences in the NT scores, but no significant differences in the subjective performance scores. Finally, the authors ran ANCOVA analyses to control for possible covariance that were interacting and affecting the dependent variable. The first variable controlled for was the numbers of training sessions, followed by the different sports variable, with no significant results. Then learning rate and number of targets were entered as covariates, and significant results were obtained (see Table 3). When learning rate and number of targets were entered in the ANCOVA analysis, there was a statistically significant difference between the variable subjective performance between the pre-test and the post-test (F(1,48) = 7.17, p = .010). The current study aimed to examine possible effects from a 5-week pre-post test quasi experiment with the NT 3D MOT tool on specific NT baseline scores and subjective performance. Fifty-four athletes from different dynamic sports participated in the pre-post test quasi experiment. The results in the current study show that the elite athletes’ specific baseline scores (initial baseline scores compared with current baseline scores) and their subjective performance improved after the 5-week period of NT 3D MOT training. However, subjective performance only improved if learning rate and number of targets in training were controlled for. The current study confirms the findings from earlier studies that NT 3D MOT training improves the NT specific baseline scores (11, 29, 33, 38). A plausible explanation is Edelman’s “neural group selection” theory, which claims that learning and development are caused by specific neural brain development (5, 6, 36). This approach to learning claims that specific experience will influence the specific neurons in the brain that are needed for that particular skill, and organize these neurons into groups and networks that together connect the different areas of the brain to execute that particular skill (7, 8). Neurons, and potential groups of neurons and networks that are not used in this process will eventually disappear (14). Thus, the development of the brain is claimed to be epigenetic, which means that the development is not entirely based on genes alone, but that the brain also needs specific restrictions from specific task behavior to develop (6). Thus, the current study confirms that specific training improves the specific skill or capacity that is trained (35, 36). To the authors knowledge, there are only a few studies that have investigated if a non-contextual, perceptual-cognitive training exercise, such as the NT 3D MOT device, has a transfer effect onto the field of athletes’ sport-specific performance (34). The results of the current study showed that in itself, training with NT 3D MOT does not have an effect on subjective performance. However, the effect was significant when learning rate and number of targets were entered as covariates in the ANCOVA’s analysis. Interestingly, the number of training sessions had zero correlations with the other variables in this current study. As noticed, there was a large range when it came to training sessions (from 16 – 76), were almost all the participants were above the recommended 4 sessions x 5weeks dose, indicating a high compliance to the training. However, we do not know whether the sessions were evenly distributed over time. Although the amount of training sessions did seem to be decisive, the findings in the current study indicate that the variables learning rate and number of targets can potentially make the difference if there is a transfer effect or not from NT 3D MOT training on subjective performance. The variable learning rate is a score that defines how much the elite athletes have improved during their training with the NT tool had they been training with two targets. Thus, this variable might say something about how motivated the athletes were during training since motivation is a necessity to improve in training (10). This is however only speculations based on earlier research and theories and should be further explored in future studies. Earlier studies also claim that genes are predictive of both learning rate and baseline scores on perceptual-cognitive training (15). The analysis in this current study did not find any effects when baseline scores were entered as covariates in our ANCOVA analysis. On the other hand, the correlation analysis shows a medium to large correlation between initial baseline, current baseline and learning rate. This confirms the claim that genes can be used to explain athletes’ scores on perceptual-cognitive tools such as the NT 3D MOT. The variable number of targets defines the quality of the NT 3D MOT training. Paying attention to several targets moving with a faster speed is more demanding than with fewer targets moving slower. Thus, the results indicate that the higher the difficulty of NT 3D MOT training, the greater development of sport specific subjective performance. The results in the current study also show that there is a significant negative correlation between baseline scores and improvement rate. This result shows that athletes who have high scores on current baseline have low scores on improvement rate, and the other way around, athletes who have low scores on current baseline have high scores on improvement rate. However, the athletes learning rate correlates positively with current baseline, meaning that athletes with high scores on current baseline (which lead to a higher difficult level during their training sessions in the experiment) leads to a higher learning rate score. On the opposite, athletes with low scores on current baseline, which give them a lower difficulty level in their training sessions, leads to a lower learning rate. Thus, the argument that quality in training makes a difference also applies to the specific learning regarding the NT baseline variable. The quality in training seems to be important if a non-contextual perceptual-cognitive tool such as the NT 3D MOT tool, has a potential transfer effect on athletes’ sport specific performance. The athletes who are managing the high load of quality training also see the best results. This finding supports research within the positive psychology approach, which claims that developing skills and capacities in order to achieve personal growth is a demanding endeavor that is facilitated by an eudaimonic approach to learning (23). Eudaimonia is characterized by emotions such as interest and engagement, which typically occur when athletes struggle to overcome a challenge or to realize their own potentials. Hedonia on the other hand is characterized by the presence of pleasure and the absence of pain (13, 18). How can these findings be interpreted? A possible explanation might be that the athletes’ motivation towards training with the NT 3D MOT tool and their ability to concentrate during training make the difference. A higher learning rate might be caused by higher motivation and training with more targets at a higher speed might be explained by the athletes’ ability to concentrate during training. This should be investigated in future research, where possible effects on executive brain functions, such as attention, should be included. Another potential explanation is that genetic legacy predicts the athletes’ learning rate and thus explains why learning rate contributes to explain the difference in subjective performance. However, the correlation results in the current study do not support such a claim. The number of targets and the speed of their movements naturally influence how concentrated the athletes need to be to perform during NT 3D MOT training. When these variables are entered together they show that learning rate increases also with several targets, which further strengthen the argument that both motivation and concentration make the difference if there is a transfer effect from NT 3D MOT training on sport specific subjective performance. A third explanation can be that the athletes’ ability to cope with stress during the NT 3D MOT training improved. This should also be investigated in future studies. Thus, the potential transfer effect seems to be depending on the athletes’ motivation and concentration towards the NT 3D MOT training intervention as well as their ability to cope with stress. An interesting question in this regard is if this is a general transfer effect related to motivation, concentration and coping with stress, explained by a discovery during non-contextual training, which makes the athletes more aware of the potential motivation, concentration and stress have in their learning? Or is it a specific transfer effect, explained by the NT 3D MOT tool. These questions should be investigated in future studies. This current study documents a significant training effect from the NT 3D MOT tool on specific training measures such as the NT baseline scores and indicates a potential training effect on subjective performance when initial baseline and targets are controlled for. However, although the results in the current study are interesting, the potential effect of perceptual-cognitive tools, such as the NT 3D MOT, will benefit from further research. In this study, only the CORE program was used, while there are a wide variety of different training protocols that can be utilized depending on what type of training one wants to emphasize. A variable that measures motivation and concentration should be included in future research to control for possible transfer effects from perceptual-cognitive tools. Experiments with a control group design and a larger number of participants are also called for in future research. Moreover, it should be noted that the collected data is partly based on self-reporting measures, such as the subjective performance measure, and it is not known to which extent these self-reports accurately reflect the variables under study. The use of perceptual-cognitive training tools in sport, such as the NT 3D MOT tool, seems to have a transfer effect on sport specific performance. However, it seems to be crucial that the athletes are motivated to concentrate through such training to keep the difficulty level high. The question if this is a real transfer effect or an awareness effect as a result from the non-contextual training tool is of secondary importance for the practical field. Thus, elite sports search for ways to enhance important capacities relevant for sport performance and the current study indicates that the NT 3D MOT tool has such a potential. This study was done in cooperation with The Olympic department in middle-Norway and the Center for Elite Sports Research, Norwegian University of Science and Technology. The researchers are grateful for the elite athletes who participated in the current study and their coaches who let them participate. 1. Appelbaum, L. G., & Erickson, G. (2016). Sports vision training: A review of the state-of-the-art in digital training techniques. International Review of Sport and Exercise Psychology, doi: 10.1080/1750984X.2016.1266376. 2. Bernier, M., Thienot, E., Cordon, R., & Fournier, J. F. (2009). Mindfulness and acceptance approaches in sport performance. Journal of Clinical Sport Psychology, 25, 320-333, doi.org/10.1123/jcsp.3.4.320. 3. Crist, R. E., Li, W., & Gilbert, C. D. (2001). Learning to see: Experience and attention in primary visual cortex. Nature Neuroscience, 4(5), 519–525. doi:10.1038/87470. 4. Cohen, J. (1988). Statistical power analysis for the behavioral sciences (2nd ed.). New Jersey: Lawrence Erlbaum. 5. Edelman, G. M. (1987). Neural Darwinism. New York: Basic Books. 6. Edelman, G. M. (1992). Bright air, brilliant fire: On the matter of the mind. New York: Basic Books. 7. Edelman, G. M. (1993). Neural Darwinism: Selection and reentrant signaling in higher brain function. Neuron, 10, 115–125. 8. Edelman, G. M. (2006). Second nature. Brain science and human knowledge. New Haven, CT, Yale University Press, London, UK. 9. Ericcson, K. A. (2003). How the expert performance approach differs from traditional approaches to expertise in sport: In search of a shared theoretical framework for studying expert performance. In K. A. E. J. L. Starkes (Eds. ), Expert performance in sports: Advances in research on sport expertise (pp. 371–402). Champaign, IL: Human Kinetics. 10. Ericsson, K. A., Krampe, R. T., & Tesch-Rӧmer, C. (1993). The role of deliberate practice in the acquisition of expert performance. Psychological Review, 100, 363– 406. doi: http://dx.doi.org/10.1037/0033-295X.100.3.363. 11. Faubert, J. (2013). Professional athletes have extraordinary skills for rapidly learning complex and neutral dynamic visual scenes. Scientific Reports, 3, 1154, 1-3. doi:10.1038/srep01154. 12. Faubert, J., & Sidebottom, L. (2012). Perceptual-cognitive training of athletes. Journal of Clinical Sport Psychology, 6, 85–102. 13. Feldman, F. (2004). Pleasure and the good life: Concerning the nature, varieties, and plausibility of hedonism. Oxford: Oxford University Press. 14. Freberg, L. A. (2006). Discovering biological psychology. New York, Houghton Mifflin Company. 15. Friedman, N. P., Miyake, A., Young, S. E., DeFries, J. C., Corley, R. P., & Hewitt, J. K. (2008). Individual differences in executive functions are almost entirely genetic in origin. Journal of Experimental Psychology, 137, 201–225. 16. Kaufman, K. A., Glass, C. R., & Arnkoff, D. B. (2009). Evaluation of mindful sport performance enhancement (MSPE): A new approach to promote flow in athletes. Journal of Clinical Sport Psychology, 4, 334-356. 17. Kee, Y. H., & Wang, C. K. J. (2008). Relationships between mindfulness, flow dispositions and mental skills adoption: A cluster analytic approach. Psychology of Sport and Exercise, 9, 393-411. 18. Kenny, A., & Kenny, C. (2006). Life, liberty, and the pursuit of utility. Happiness in philosophical and economic thought. Exeter: Imprint Academic. 19. Mangine, G. T., Hoffman, J. R., Wells, A. J., Gonzalez, A. M., Rogowski, J. P., Townsend, J. R., & Stout, J. R. (2014). Visual tracking speed is related to basketball-specific measures of performance in NBA players. Journal of Strength and Conditioning Research, 28(9), 2406–2414. doi:10.1519/JSC. 0000000000000550. 20. Mann, T. Y., Williams, A. M., Ward, P., & Janelle, C. (2007). Perceptual-cognitive expertise in sport: A meta-analysis. Journal of sport & exercise psychology, 29, 457-78. 10.1123/jsep.29.4.457. 21. Martin, W. F. (1984). An insight to sports: Featuring trapshooting and golf. Seattle, WA: Sports Vision. 22. Moen, F., & Firing, K. (2015). A Qualitative Exploration of Possible Effects from Attention Training Techniques on Norwegian Junior Athletes in Sport. The Sport Journal, retrieved from: http://thesportjournal.org/article/experiences-from-attention-training-techniques-among-athletes/. 23. Moen, F., Vittersø, J. (2015). Emotions in sport: Contributions from hedonic and eudaimonic well-being. Athletic Insight, 7, 239-254. 24. Moen, F., Firing, K., & Wells, A. (2016). The effects of attention training techniques on stress and performance in sport. International Journal of Applied Sport Sciences, 28, 213-225. 25. Moran, A. (2012). Concentration: Attention and performance. In S. M. Murphy (Ed. ), The Oxford Handbook of Sport and Performance Psychology. Oxford library of psychology. doi: 10.1093/oxfordhb/9780199731763.013.0006. 26. Miyake, A., & Friedman, N. P. (2012). The nature and organization of individual differences in executive functions: Four general conclusions. Current directions in psychological science, 21(1), 8-14. doi:10.1177/0963721411429458. 27. Quevedo, J. L., Padros, B. A., Sole, F. J., & Cardona T. G. (2015). Perceptual-cognitive training with the Neurotracker 3D-MOT to improve performance in three different sports. Apunts Educacion Fisica Y Deportes, 119, 97-108. 28. Parsons, B., Magill, T., Boucher, A., Zhang, M., Zogbo, K., Berube, S., & Faubert, J. (2016). Enhancing cognitive function using perceptual-cognitive training. Clinical EEG and Neuroscience, 47(1), 37–47. doi:10.1177/1550059414563746. 29. Perico, C., Tullo, D., Perrotti, K., Faubert, J., & Bertone, A. (2014). The effect of feedback on 3D multiple object tracking performance and its transferability to other attentional tasks. Journal of Vision 14 (10), 357-357. 30. Revien, L., & Gabour, M. (1981). Sports vision: Dr Revien’s vision training exercises for athletes (pp. 350–370). New York: New York Publishing. 31. Riemer, H. A., & Chelladurai, P. (1988). Development of the Athlete Satisfaction Questionnaire (ASQ). Journal of Sport and Exercise Psychology, 20, 127-156. 32. Riemer, H. A., & Toon, K. (2001). Leadership and satisfaction in tennis: Examination of congruence, gender and ability. Research Quarterly for Exercise & Sport, 72, 243-256. 33. Romeas, T., & Faubert, J. (2015). Soccer athletes are superior to non-athletes at perceiving soccer- specific and non-sport specific human biological motion. Frontiers in Psychology, 6, 705, 1-11. doi:10. 3389/fpsyg.2015.01343. 34. Romeas, T., Guldner, A., & Faubert, J. (2016). 3D-Multiple object tracking training task improves passing decision-making accuracy in soccer players. Psychology of Sport and Exercise, 22, 1–9. doi:10.1016/j.psychsport.2015.06.002. 35. Seiderman, A., & Schneider, S. (1983). The athletic eye: Improved sports performance through visual training. New York, NY: Hearst Books. 36. Sigmundsson, H., Trana, L., Polman, R., & Haga, M. (2017). What is trained develops! Theoretical Perspective on Skill Learning. Sports, 5, 1-11. doi:10.3390/sports5020038. 37. Stine, C. D., Arterburn, M. R., & Stern, N. S. (1982). Vision and sports: A review of the literature. Journal of the American Optometric Association, 53(8), 627–633. 38. Zhang, X., Yan, M., & Yangang, L. (2009). Differential performance of Chinese volleyball athletes and nonathletes on a multiple-object tracking task. Perceptual and Motor Skills, 109(3), 747–756. doi:10.2466/pms.109.3.747-756.